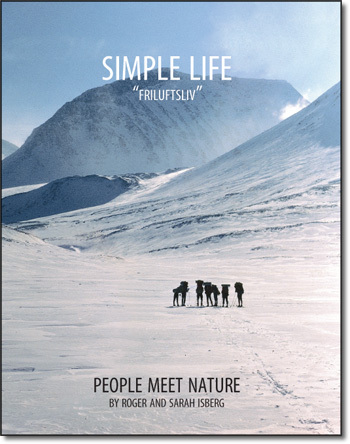 Friluftsliv (pronounced: free-looft-sleev) literally means “free-air-life”, and is translated by Roger and Sarah Isberg for their book as “simple life.” Originally written in Swedish, it was published and reprinted three times there before being expanded and translated to English. It defines the philosophy and pedagogical approach I used in Sweden for 25 years, teaching at Sjovik Folk College and training backcountry mentors in a form of outdoor life that uses simple, traditional wilderness skills, crafts, and knowledge. Those of us who eschew the adventure and high-tech approach to outdoor living and focus on the traditional skills and knowledge seldom find books by kindred spirits, but this is one of those books. The Swedish approach described in the book seeks to filter out the excess gear and clutter which distract us from the experience of outdoor living, much like the bushcraft and guide training programs we’ve been running for ten years. Reading it has been a breath of fresh air. If you’re involved with outdoor education or leading trips in the back country it will give you much to think about. I recommend it highly. Check it out at Amazon and at Trafford Publishing.